I feel like I've been writing only about my workouts/training lately. Maybe I haven't. I forget. Honestly, my mind is in so many places these days that it's hard to keep track. My next blog will be more of a life update.... got some exciting things going on. The 5 x R wasn't really planned, just sorta happened due to crappy weather. Yup. More rain. I was supposed to lead a group ride through Santiago Canyon but that got canceled. Instead? The trainer, all alone. I couldn't rearrange my weekend and ride tomorrow instead because I'm already riding tomorrow too. Plus, I had a key brick sess scheduled for today that I was looking forward to. Originally the plan was for a 3ish-hour bike with a 60min t-run. To keep me entertained, I was told about a free movie website, so I turned on Slumdog Millionaire (random). A scene from the set up. 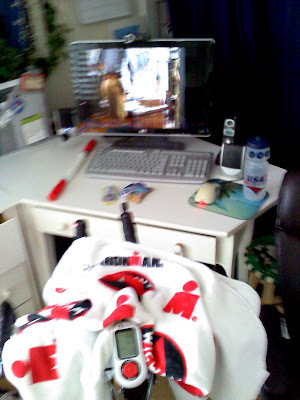 Unlike Linsey Corbin, I don't have a "man cave" for workouts, just my room. It's not so bad. Two big windows + ceiling fan keep it cool & breezy, and decent computer for movie-watching and good tunes. I was crusin' until 70 min later when the movie paused and a message popped up saying I had to wait 50 min before I could continue watching, wtf? Change of plans: It was only sprinkling outside at that point so I decided to "spice up" the brick and make it 5 x R.
I changed clothes in each transition (trainer sess = sopping wet, running in rain = sopping wet). I went through 5 sport bras, 5 shorts/stretchy pants, tons of towels, etc etc etc. It's all still sitting in a sweaty pile right outside my door (yuck), along with a bunch of those little pull-off parts of GU packs--I find those things everywhere! All in all it was ~3:45 workout but more than 4 hrs with transitions. It left me thoroughly trashed. I swear, trainer sessions are not easy--there's never downhills and no coasting so never a "break." Plus, having a power meter keeps me in check... no slacking! Post-workout I ate the biggest sweet potato I could find (mixed with Fage, stevia and salt), along with an "everything-but-the-kitchen-sink" salad. Great workout. We were supposed to do a similar ride/run today, but since most the roads were closed and nobody wanted to do a 3 hour trainer ride I told a couple people to just do 90 min trainer, run, 90 minute trainer, run. Awesome workout! Bummer about the movie. I LOVE LOVE LOVE sweet patotos. Could eat those guys every day. Nice job on the workout front! Your set up looks like it works for you. Enjoy the rest of the weekend. Your doing a great job with all the training. That sounds like a great workout. I am totally impressed! was is it a yam or a sweet potato? Yes, trainers are hard. That sessions sounds like fun. those ride/run and repeats bricks kill me! nice work! Now clean up that pile of 'yuck'.